Q: The leg that was treated with endovenous laser ablation falls asleep soon after sitting down, is this normal? I am two weeks out from endovenous laser ablation (EVLA) and have had several complications that my physician has seen me for. A blood clot was ruled out but now the leg that had the procedure falls asleep very soon after sitting down. Is this normal? A: This should resolve with time, especially if you still have some leg swelling. I would give it up to 6-8 weeks to resolve, assuming this is your only complaint, but you should always stay in close follow-up with your treating physician. Whether you’re standing still, running to your next appointment, or dancing the salsa, think about how much time you spend on your feet. Most Americans log 75,000 miles on their feet before they reach age 50, according to the American Medical Podiatric Association (APMA). It’s no wonder that Dr. Sunny Raleigh, a primary care physician at True North Health Center in Falmouth, Maine, says that feet are a vital component to overall health. The fascial, musculoskeletal, nervous, lymphatic, and venous systems in the feet all have intimate feedback connections to the rest of the body, so paying attention to the feet allows Dr. Raleigh to “see the whole person” and assess if something else may be contributing to a problem. She emphasizes the importance of addressing, not just the physical manifestations or symptoms, but also the underlying issues. Her approach is to look upstream for the causes of the downstream diagnosis, continually seeking answers to the question: what is the systemic breakdown that we need to try to repair? Problems in the feet can be manifestations of arterial or venous concerns. Peripheral arterial disease (PAD) and other related disorders are important to consider when examining the foot. However, the close correlations between foot issues and venous disease- the impairment of blood flow back up towards the heart- also deserve attention. If venous return is impeded due to damaged valves in the venous system, then the backward flow of blood can pool in the legs and feet. The vein insufficiency, or venous reflux, can cause leg pain and fatigue, spider veins or varicose veins. If left untreated, it can lead to edema, corona phlebectasia and ultimately, ulcers. Predominantly, most vein issues will present in the medial ankle or anterior shin area. If veins aren’t functioning properly, then edema will often occur. Edema is the venous symptom that is most frequently encountered. People with mild edema in their feet and legs don’t always realize it, but over the years it can create chronic reactions in the skin, such as hemosiderin staining, which is a brown or rusty discoloration of the lower legs. When vein valves fail, regurgitated blood forces red blood cells out from capillaries; those dead cells then release iron, which gets stored in the tissues as a hemosiderin. The onset of edema can be a prelude to other more serious issues, as the skin becomes susceptible to breakdown and venous ulceration. Dr. Raleigh suggests that there may also be a role for osteopathic manipulative medicine in treating vascular and venous insufficiency. A 2012 study showed that adding myofascial manipulation to venous treatment increased venous return in post-menopausal women (when compared to direct venous treatment alone). Because the primary care physician is typically the first encounter a patient with complaints around venous disease and related diseases will have, that initial contact can set the stage for a treatment plan. Dr. Blease has been practicing podiatry for more than 25 years. He explains that when he was in podiatry school there was an emphasis on the arterial system, with little study of the venous system. He also recalls having a patient who was told she could never have surgery done on her foot because she’d had her veins stripped and the potential for severe swelling and delayed healing were great. Dr. Masiak concurs. If he sees that a patient has venous insufficiency, he will consult a vein specialist for possible treatment. Vein insufficiency (often accompanied by edema) may be a contradiction to surgery, because of the likelihood that the skin will have trouble healing. He also recognizes that podiatrists can play a role in early detection for venous or vascular issues. “We see a lot of lower extremities, so we can be a good source for identifying vein-related problems,” said Dr. Maisak. Even the APMA, the leading professional organization for podiatrists in the U.S., has acknowledged the link between podiatry and phlebology. In 2013, the APMA joined the “Rethink Varicose Veins” campaign to raise awareness of venous disease diagnosis and treatment. When treating varicose veins, laser therapy remains the best option, a new study says. Researchers in the study examined 798 participants who had varicose veins and were treated at 11 vascular surgery centers in the United Kingdom, between November 2008 and October 2012. The participants underwent one of three types of treatments: closing off the veins with a laser, injecting a drug “foam” into the vein or surgically removing the vein. After six months, the researchers compared the outcomes, looking at how well the treatments worked and at their complication rates, as well as how the participants rated the change in their quality of life since their treatments. Varicose veins are blood vessels that have become swollen, enlarged and twisted. Improperly working valves in the veins cause the disorder, Brittenden explained. In people who have this condition, blood returns up to the heart from the veins in the legs because of the contraction of the calf muscles, she said. Normally, valves in these veins prevent blood from flowing backwards, down towards the feet. “People with varicose veins have leaky valves, which means that some blood flows backward and pools in the veins, causing them to become enlarged,” she said. The procedure called endovenous laser ablation, or laser therapy, uses heat generated by laser energy to seal off faulty blood vessels, diverting blood flow immediately to nearby healthy veins. Foam treatment involves injecting drugs into a blood vessel. The medicines, when mixed with air, cause the vessel wall to thicken, which also helps to seal off blood flow. The recent study showed that foam was less likely than the other treatments to completely close a vein that had leaky valves, which may increase the likelihood that a patient will need future treatment, Brittenden said. In the study, about 1 percent of patients who underwent treatment with a laser experienced complications such as lumpiness, skin staining and numbness. About 6 percent of those who received the foam treatment, and 7 percent of those who underwent surgery experienced such complications, according to the study. The researchers also found that successful ablation of the great saphenous vein occurred in 83 percent of those who received the laser treatment and 84.4 percent of the participants who underwent surgery. These numbers were significantly higher than the 54.6 percent who had such successful ablation after the foam treatment. The great saphenous vein, the longest in the body, runs along the length of the leg. The study appears in today’s (September 24) issue of the New England Journal of Medicine. Dr. Kevin McMullen, a vascular surgeon at Surgical Hospital of Oklahoma who was not involved with the study, said he agreed with Brittenden’s conclusion. “Laser is preferred over surgery or foam due to higher success rates with the least amount of complications,” he said. Laser therapy works better than foam on larger veins, as the success rates for foam treatments worsens with increasing vein size, McMullen said. However, surgery may be the best choice for patients who have previously had vein procedures, or who have anatomical issues, such as veins that are very close to the skin or are larger than three-quarters of an inch (20 millimeters) in diameter, he said. Both men and women get varicose veins, she said. The condition is more common in pregnant women, older patients, overweight people and those who stand for long periods. It is also more prevalent in people who have a family history of varicose veins. People can’t prevent varicose veins from forming, but may be able to delay their formation or prevent existing varicose veins from getting worse, according to the National Institutes of Health. The NIH recommends that people avoid standing or sitting for a long time without taking breaks; avoid crossing their legs when sitting; and keep their legs raised when sitting, resting or sleeping. Losing weight and doing exercise that works the leg muscles can also help, the NIH said. The doctor at North Shore Vein Center will perform a full evaluation on every patient to determine the best method of treatment on an individual basis. Laser treatment is a proven method, but there are other procedures available that may better suit a specific patient’s needs. This article is purely informational. Varicose veins usually develop in the legs. They often stick out and are blue in color. The following treatments for varicose veins can be done in a doctor’s office or clinic. You will receive local anesthesia to numb your leg. You will be awake, but will not feel pain. Your doctor will inject salt water (saline) or a chemical solution into the varicose vein. Your doctor will thread a flexible tube (catheter) through the vein up to your groin. These treatments are generally safe. Ask your doctor about specific problems that you might have. This article originally came from the New York Time Health Guide. Within the last few years, there have been tremendous advances in the treatment of varicose veins. The most dramatic advance has been the introduction of non-surgical techniques that have virtually replaced traditional surgical therapy known as vein stripping. This newer procedure makes use of a laser to heat and close the troublesome veins that are leaking and causing the veins to enlarge. These minimally invasive solutions to varicose vein disease offer: elimination of a hospital-based procedure, quicker recovery times and an overall improved patient satisfaction. The North Shore Vein Center, the largest vein center on Long Island, is one of the few facilities in the country with experience using all of the currently available advanced methods in non-invasive varicose vein care. We have a fully accredited outpatient ambulatory surgical facility staffed by RVT certified sonographers, a fully certified vascular laboratory and physicians who are triple board certified in General Surgery, Vascular Surgery and Phlebology. 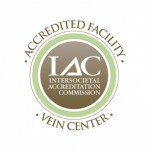 No other vein center on Long Island can claim that level of certification and expertise. At the Center, the initial visit includes the consultation and venous ultrasound workup. We then submit the appropriate documentation for insurance authorization if medically indicated. The second visit usually involves treatment. We inform all of our patients presenting with superficial venous disease that the initial management, therapy, follow-up and procedures to treat recurrences are managed in the office. Hospitalization no longer plays a role in the treatment of varicose veins. For more information on how to schedule a free vein screening with Dr. Mark Schwartz at The North Shore Vein Center, call 516-869-VEIN (8346). At the 1992 Summer Olympics, swimming legend Summer Sanders won two gold medals, one silver and a bronze for the U.S. swim team. Years later, after the birth of her second child, this healthy, active athlete developed varicose veins- a precursor to chronic venous insufficiency (CVI). Fast-forward to 2012. Sanders has had her veins successfully treated and her legs no longer feel “achy and heavy, especially after a long day.” She is now the national spokesperson for Rethink Varicose Veins, an educational campaign that encourages those suffering from varicose veins to learn more about their condition and to speak with a vein specialists about treatment options. The campaign started as a joint effort of the American College of Phlebology (ACP), Society for Vascular Surgery (SVS) and American Venous Forum (AVF). This year, the American Podiatric Medical Association (APMA) joined the coalition. In fact, Sanders helped open the 2013 APMA Annual Scientific Meeting in July. “Podiatrists play a role in keeping America walking, and venous disease is a common component of that,” he said. For Dr. Caporusso, the venous-related conditions he encounters most often are varicose veins, which affect the feet and ankles, and ulcerations, usually on the inside ankle toward the midline of the body. He says that podiatrists also have patients with unexplained calf pain; they must determine whether the patients has Deep Vein Thrombosis (DVT), which could be life threatening. More than 30 million Americans suffer from vein disease each year, but less than 10% seek treatment. Efforts like Rethink Varicose Veins can go far in educating the public that venous disease is a health concern worthy of diagnosis and treatment, especially when different medical professionals take a team approach toward patient care. “Many of our colleagues work with vein specialists and vascular surgeons, and our partnership with this campaign allows us to go even further,” said Dr. Caporusso. Vein Heathcare News originally published this information. Vein problems are common in the U.S. and around the world. By age 50, nearly 40% of women and 20% of men have some type of significant vein disorder. Vein disorders are manifested in a variety of ways. Varicose veins are large, blue, ropy structures which bulge in the skin and are often unsightly as well as painful. Spider veins are small blood vessels in the skin, either blue or red, and are often arranged in clusters or branches. Stasis dermatitis is the red or brown skin color change around the ankle and lower leg, caused by chronic venous stasis. Venous ulcers develop on the inside of the ankle most commonly, but sometimes on the outside as well. The treatments to eliminate varicose veins and all vein abnormalities have improved dramatically in the past 10 years. Newer, less invasive methods have proven far superior to the old stripping operations. Leg pain is relieved, leg swelling often goes away within a couple of weeks and the unsightly veins disappear. Many of our patients wear shorts after years of hiding their legs. Quality of life is significantly improved in most of our patients, for they can again become active. Equally important, Medicare and all insurance companies pay for many of these procedures. All procedures can be performed in our Vein Center, hospitalization is unnecessary. All patients with symptomatic vein insufficiency can be treated, almost regardless of age. We have treated patients as young as 16 and as old as 95.